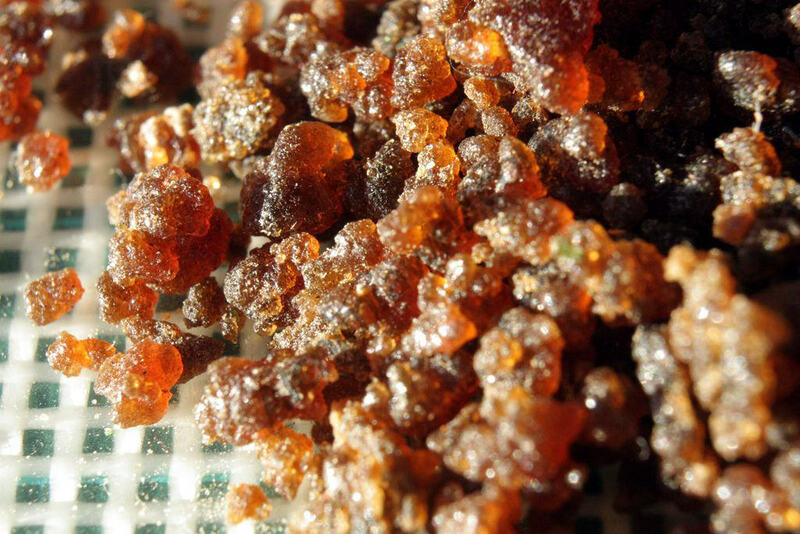 Before attempting to make the best possible ice water separation, we should study a bit of theory that will help us to better understand the process of removing resin glands. The Alchimiaweb team wants to make things easy for you, so you can read the theory in our post about dry sift hash. 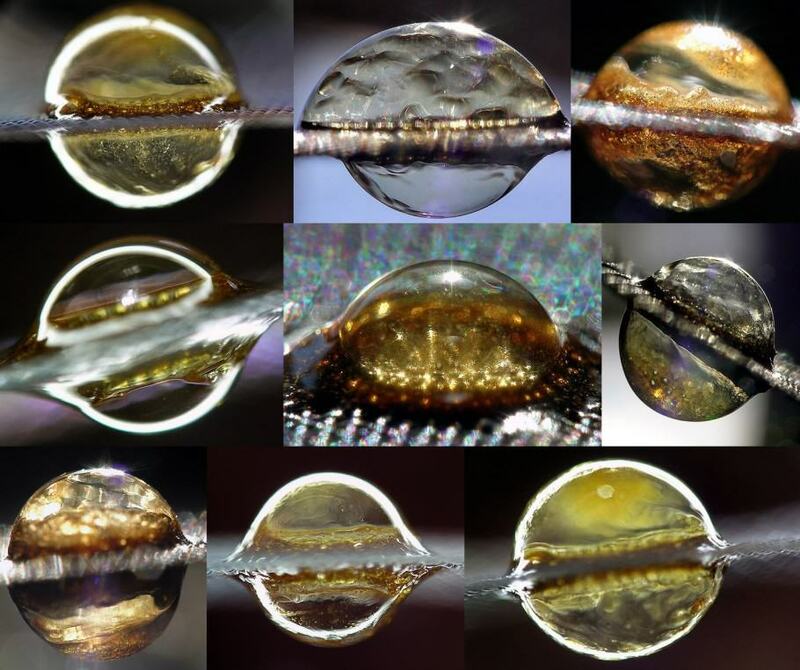 Once we have this concepts clear, we can see now how to make the purest possible bubble hash. It should be noted that, when we speak about purity, we are referring to the highest possible concentration of trichome heads, reducing the presence of contaminants like dust or plant debris to the minimum. In short, anything but glandular trichome heads is considered a contaminant. Small washing machine, which makes the stirring process automatically, saving labor and time. You can also use a plastic bucket to stir the mix in case you don’t have a machine. Naturally, we’ll also need plant material from which to separate the resin glands. We can use either trim or buds, dried or fresh, although if we are using buds we should try to crumble them into smaller pieces in order to increase yields. For this post, we used dry outdoor trim, although many times best results – regarding purity – come from indoor plant material, since plants have been in a much cleaner environment, without all the dust, insects, etc. found outdoors. Ideally, our plant material should be frozen very fast (flash freezing), but this is something complicated for amateurs. Then, our options are freezing it in our conventional freezer or just keeping it in the refrigerator, without reaching the freezing point. We prefer chilling our plant material (especially when it is fresh) since in this way the water inside the buds don’t freeze and pierce the plant tissues, enabling chlorophyll to escape and harm our resin. This is an important point especially with live resins. You can check our post on fresh chilled material to make hash to know more about this phenomenon. If we use dry plant material, we should soak it for a while to re hydrate it; in this way, we’ll find much less plant debris in our hash. Put your screen bags in one of your buckets. You should put the screens in ascending order: 45- 73 – 120 – 160 – 190 – 220 microns. Cover the bucket and leave it for later. Put layers of ice cubes and frozen/chilled buds in the other bucket (or inside the screen bag of the washing machine, in case you’re using it). Fill the bucket/machine halfway with ice and weed and then add ice cold water until soaking everything about 5 cm deep. When the water is between 0-4ºC – and the plant material is hydrated – gently stir the mix with our skimming spoon/machine for about 5-7 minutes. 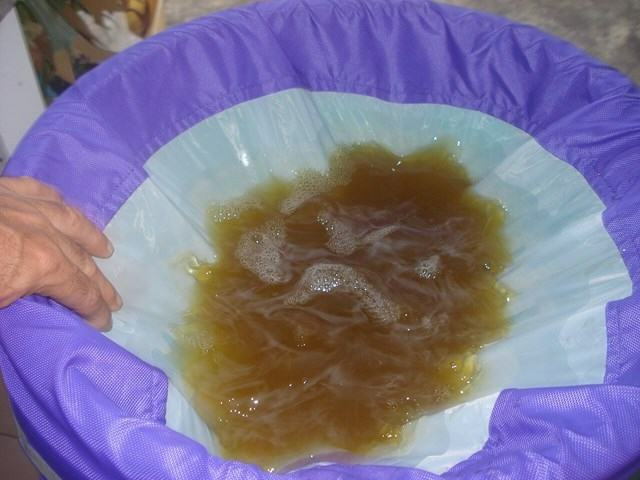 We don’t want to beat the mix since this would result in a more contaminated resin, we can do it on the second run. Now, let it rest for 4-5 minutes before passing the mix through the screens. Pass the mix through your bags and start collecting the different screens. The 220 micron bag contains the ice cubes and the buds, which we’ll keep chilled for the next run. Remove the 190 and the 160 micron bags, which usually have poor yields, basically plant debris and trichome stalks. The 120 screen can yield very nice resin, and the 73 screen contains our precious top grade hash. If the process was correct, we’ll be surprised with the yield of this bag, since we really don’t need much beating to remove the trichome heads from their stalks. The 45 micron screen contains our 2nd grade hash. Now, we are ready for the second run. Mix again the cold water, the ice cubes and the buds and beat it for around 10 minutes. Experience is required to observe which are the best phenotypes and screen sizes for making top grade concentrates. Use a frozen spoon or a plastic card to remove the resin from the bag. The best way to dry our resin is placing it in a dark, cool and dry place. Heating it is not advised since we can harm its organoleptic and psychoactive features. Place it in a non-stick surface and chop it as fine as possible. Some people use a frozen microplane or a strainer for this purpose. Others put the chopped resin in the refrigerator to dry it. Basically, we only have to follow the same advice than when drying our marijuana buds regarding light, temperature and humidity. Once the resin is chopped, put it inside a small container and cover it with a piece of screen so no particles fall onto it. Now we only have to wait 4-5 days to taste our homemade hash. You can cure the resin for some days or weeks and see if you like it better this way. 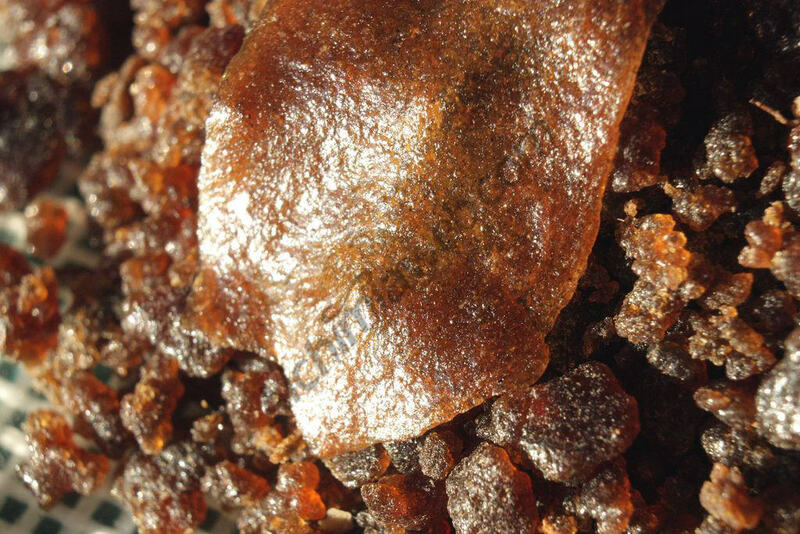 Glad you learned how bubblehash works, when done properly it is one of the finest cannabis concentrates! Are you using washing machine? Thanks, always thought it would be harder then this! Now if i can just find some cheap bubble bags or some cheap screens. I’ve been making a few different types of tinctures and occasionally an infused olive oil and coconut oil mix. I have a few questions, 1st i normally decarboxylate my already dried/cured buds (unfortunately I can no longer grow here in NJ because of the risk, but growing and creating my own strains was my 1st passiom after smoking it!) But i decarb my buds in a sealed glass jar(s) in the oven for 45-60 minutes at 240-250° F, then I take the jar (s) out of the oven and let them cool before opening them. Then its straight to the tincture or oil. But could I decarboxylate buds then make the bubble hash? I’m thinking that might not work? Then my 2nd question is if I cant decarboxylate then make bubble hash, then how long would you suggest to decarboxylate the bubble hash for in the oven and would the same temperature be used to decarboxylate hash and to decarboxylate buds? And my last question is you said you do 3 washes then dry the buds and use them for cannabutter or for an ethanol or butane extraction. So about how much potency do you believe might be left after 3 washes? You don’t have to give me an exact answer just your guess or estimate on if say 25% is left over or 10% or whatever. Cause I’m wondering how much weight in dried out buds I’d need to make a decent everclear tincture or decent cannabutter or cannaoil? Just wondering about how much potency might be left after 3 washes or if maybe I should just do 1 or 2 washes then make my tincture or cannabutter/oil? Sorry for all the questions and I’ve read lots of articles on this site since I found it last night, definitely have enjoyed it so thank you! As you may know, you can decarboxylate your material (either buds or hash) at different temperatures, thus needing more or less time to complete the process. I’d suggest to use lower temps and prolonge the process a little bit, let’s say 90 minutes at 210F. Some people even decarb their material for 24 hours at around 180F. It’s much better to make the hash and decarboxylate it later. Logically, the more washes you do the less quality and potency you’ll get on your last washes. Also, some plants are done with the second wash, while others can be washed 4-5 times. But yes, the more you wash the more the quality decreases. I’ll put an example: with the Sour Diesel Riri cut, I get 70-80% on the first wash, and the ramaining on the second. No need at all to wash her 3 times. On the other hand, I’ve washed the Gorilla GLue #4 up to 4 times, with amazing yields and quality on the third wash. If you want your tincture to be of decent quality, I’d suggest to wash the plant just once (3-5 minute agitation) and then use the plant material for cooking or extracting with some solvent. In this way you’ll have excellent hash and a very nice tincture or butter. Here you have some options for your bags to make hash. If you want my advice, do not purchase cheap bags. They’re not worth it unless you’re satisfied with a mediocre product. 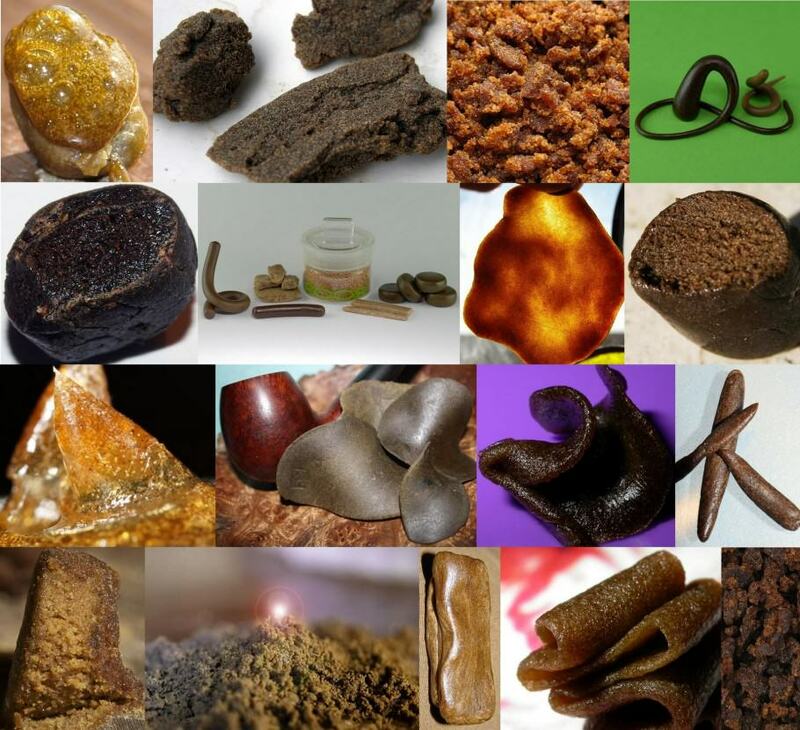 You can get top grade hash with Pure Extract Bags and Bubble Bags. Finally, I always recommend to process fresh plant material whenever possible, it’s much easier to get top quality hash with fresh buds than with dried/cured buds. I think this post will be of your interest. Awesome article. Question: Flash freezing for live resin. Can you make a home made deep freezer by putting dry ice and alcohol (Iso) in a container and then putting fresh buds into a metal box of some sort and freeze the fresh plant material that way? Kind of a poor man’s cryogenic freezer. I believe the temp got to -90 F in the dry ice mix…..
Hi thanks for your comment, that sounds like an interesting idea, and yes it would probably work however in my own personal opinion it’d be overkill, I don’t think you really need it to be that cold. Whenever I’ve frozen freshly cut material I’ve simply turned the freezer to maximum power for a few hours previous to freezing the material and it’s done a superb job, getting to around -30ºC which very quickly froze the buds, so I can’t see all the effort being really necessary. Of course, if you do decide to make the DIY flash freezer, please let us know how it goes, we’re genuinely fascinated. All the best and happy freezing! Did my first wash last night and have been devouring your articles thank you! There’s one aspect I’ve been unable to get my head round – what does the cold do? Is the cold just to snap the stems of the trichomes, and then unnecessary? Or is it to freeze the trichome heads to prevent them dissolving in the water and therefore passing through the bag filters? If the latter, can they melt then be refrozen (one tutorial left a mix overnight and still got hash)? What is their melting point? Another question – how nervous should I be drying the hash? I would rather avoid using a strainer (I think I lose some, I compress the heads, make a mess, mix my piles, and takes a lot of time) – I’d be more comfortable doing a slow fridge dry. But I’m using a strainer because no tutorial out there seems to cover drying, so I’ve no idea how sensitive the hash is (and the only way to find out is to take a risk!) In the video above there was a real rush to seive almost immediately. Why? Hi Chris, we’re happy you’ve found the articles useful, thanks for your comments and questions. Firstly, the cold is primarily to help the resin heads to “snap off” the plant, as you say, while the trichomes won’t dissolve if the water isn’t cold, they’ll be more sticky and much more difficult to work with i the water isn’t as close to freezing as possible. The cold is also useful in terms of preserving the terpene profile of the hash and also to prevent chlorophyll from contaminating the end product. The warmer the water, the more chlorophyll will be extracted from the leaf matter, and this may end up colouring the hash somewhat. As for drying, well it’s probably the most important part of the process. The idea is to break the hash up into pieces that are as small as possible, to aid drying and to ensure no moisture remains trapped inside the hash. 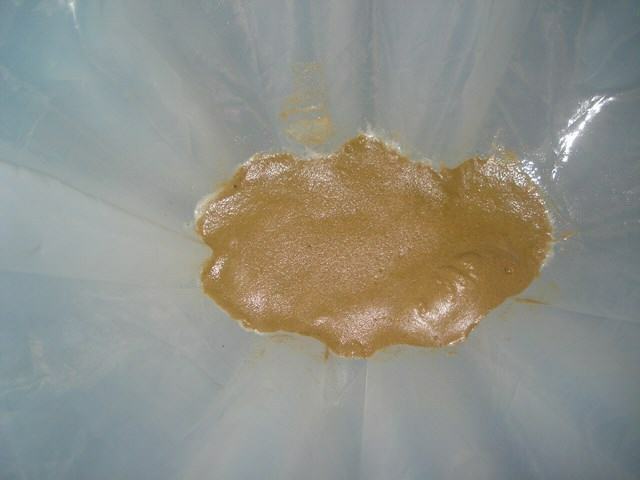 For this reason many extractors like to sieve the hash fresh out of the collection bag, while it still has enough liquid to enable it to pass through the mesh. I’ve personally never been a fan of this method, always preferring to either chop the hash very finely with a spatula blade, or alternatively using a microplane, which involves taking the hash from the collection bag, forming it into a small patty which goes into the freezer overnight, with the microplane itself to ensure everything is nice and cold. The next day you can finely grate the solid frozen patty, spreading it evenly over a sheet of parchment paper to dry. Some hash makers like to use pizza boxes (clean ones, not reused!) to keep the hash covered while drying. I hope that’s cleared up any doubts for you, happy hashing! Tim, can’t say how grateful I am that you took the time to respond so fully to my questions. I browsed all over the place and watched an obsessive amount of video tutorials and you very kindly cleared up the gaps I couldn’t quite glean from all of the above. Huge thanks! Can you use the leftover bud for anything? Hi Nat, thanks for your question. Yes, you can definitely use the leftover flowers and leaves for something, as the bubble hash process won’t remove all the trichomes. The easiest way to make use of them is for cooking with butter (you don’t even need to dry the remains, as they will be cooked in water as per the recipe in our post about cannabis butter or the alternative vegan option). You could also dry the leftovers and make a tincture with alcohol or glycerine, or even make BHO, and although the quality would not be the greatest it’s be ideal for using in edibles or topical preparations. I hope that’s given you some ideas, all the best and happy hashing!